Make 3 patties with the ground beef, season with salt and pepper. 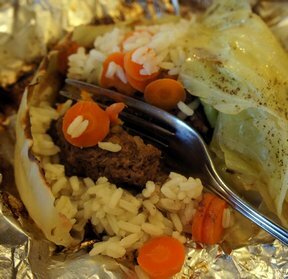 Place the beef on a 12-inch square piece of aluminum foil and put a slice of onion on top of the meat. 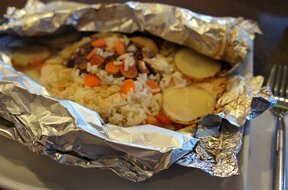 Next, add sliced potato, carrots and rice, to your preference. Season all to taste and top each with a tablespoon of butter. 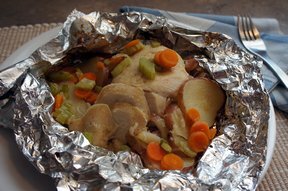 Fold the foil up around the ingredients, to seal in the juices. Place all the little dinners on a cookie sheet and bake at 350 until done, approximately 30 minutes. 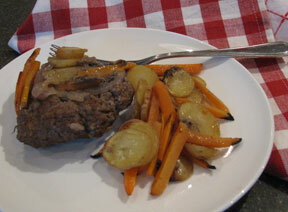 VARIATION: A pork chop can also be used in these dinners. "I use Lawry's salt to season the packets and always add cooked rice to the top. I am going to try pork chops next time and see what happens."